I extracted this information from Leon Karlak off of the Yahoo! Loopframe_Guzzi news group. Any 22 mm or 7⁄8 inch handlebar switch can be fitted, but period correct switches are more difficult to find. Fortunately, Yamaha still has a nice unit available. Drop by your local Yamaha dealer and pick up part number 396-83972-11-00 (YHA205). This switch was originally fitted to the 1970's RD 125. Charles Hamer was kind enough to send me the wiring code cross-reference to make installation on our V700, Ambassador, and Eldorado models quick and easy. 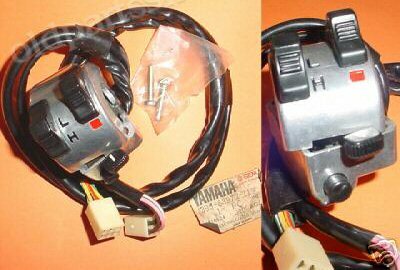 Yamaha handlebar switch YHA205 / YHA 205 / YHA-205.